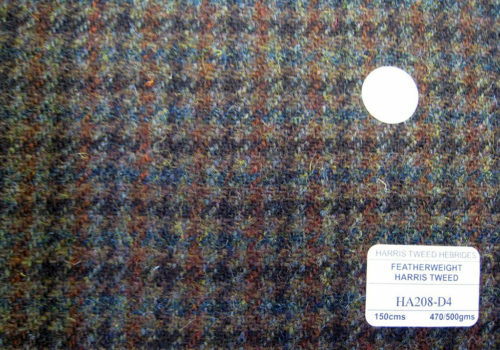 Harris Tweed is a cloth handwoven by islanders at their homes in the Outer Hebrides of Scotland, finished in the Outer Hebrides, and made from pure virgin wool dyed and spun in the Outer Hebrides. Once sheared the wool is scoured before being delivered in large bales to the mills of the main tweed producers where it is then dyed in a wide variety of colours for blending. The freshly dyed coloured and white wools are weighed in predetermined proportions and then thoroughly blended by hand to exact recipes to obtain the correct hue. It is then carded between mechanical, toothed rollers which tease and mix the fibers thoroughly before it is separated into a fragile, embryonic yarn.This soft yarn then has a twist imparted to it as it is spun to give it maximum strength for weaving. The spun yarn is wound onto bobbins to provide the ingredients of weft (left-to-right threads) and warp (vertical threads) supplied to the weavers. This vitally important process sees thousands of warp threads gathered in long hanks in very specific order and wound onto large beams ready to be delivered, together with yarn for the weft, to the weavers. All Harris Tweed is hand woven on a treadle loom at each weaver's home on a 'double-width' Bonas-Griffith rapier loom in the case of mill weavers, or normally an older 'single width' Hattersley loom in the case of independent weavers. The weaver will 'tie in' their warp by threading each end of yarn through the eyelets of their loom's heddles in a specific order then begins to weave, fixing any mistakes or breakages that occur until completed. 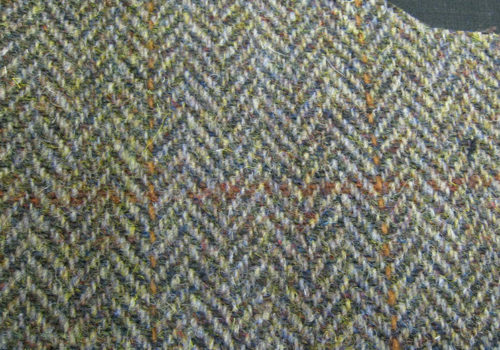 The tweed then returns to the mill in its 'greasy state' and here it passes through the hands of darners who correct any flaws. Once ready the cloth is finished. Dirt, oil and other impurities are removed by washing and beating in soda and soapy water before it is dried, steamed, pressed and cropped. The final process is the examination by the independent Harris Tweed Authority which visits the mills weekly, before application of their Orb Mark trademark which is ironed on to the fabric as a seal of authenticity. For centuries the islanders of Lewis and Harris, the Uists, Benbecula and Barra have woven cloth by hand calling it 'clò-mòr' in the original Gaelic or 'big cloth'. Originally this handmade fabric was woven by crofters for familial use, ideal for protection against the colder climate of the North of Scotland. Surplus cloth was often traded or used as barter, eventually becoming a form of currency amongst the islanders. For example, it was not unusual for rents to be paid in blankets or lengths of cloth. By the end of the 18th Century, the spinning of wool yarn from local raw materials was a staple industry for crofters. Finished handmade cloth was exported to the Scottish mainland and traded along with other commodities produced by the Islanders, such as dry hides, goat and deer skins. The original name of the cloth was tweel, Scots for twill, it being woven in a twilled rather than a plain pattern. A traditional story has the name coming about almost by chance. Around 1830, a London merchant received a letter from a Hawick firm about some tweels. The London merchant misinterpreted the handwriting, understanding it to be a trade-name taken from the river Tweed that flows through the Scottish Borders. 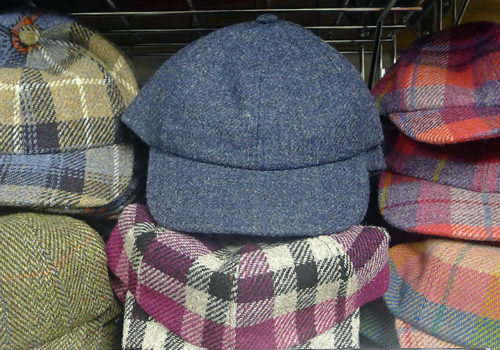 Subsequently, the goods were advertised as Tweed, and the name has remained ever since. As the Industrial Revolution reached Scotland, mainland manufacturers had turned to mechanization, but the Outer Hebrides retained their traditional processes. Lewis and Harris had long been known for the excellence of the weaving done there, but up to the middle of the nineteenth century, the cloth was produced mainly for home use or for local market. When Alexander 6th Earl of Dunmore inherited the North Harris Estate from his father in 1836, production of tweed in Outer Hebrides was still entirely manual. Wool was washed in soft, peaty water before being coloured with dyes from local plants and lichens. It was then processed and spun, before being hand woven by the crofters in their cottages. Traditional island tweed was characterized by the flecks of colour achieved through this use of the vegetable dyes, including the lichen dyes called "crottle" (Parmelia saxatilis and Parmelia omphalodes which give deep red- or purple-brown and rusty orange respectively). These lichens are the origin of the distinctive scent of older Harris Tweed. Upon the death of the 6th Earl of Dunmore in 1843, responsibility for his estate on the Isle of Harris passed to his wife, Lady Catherine Herbert. Lady Catherine noticed the marketing potential and high quality of the tweed cloth produced locally by two sisters from the village of Strond. Known as the Paisley Sisters, after the town where they had trained, the fabric woven by them was of a remarkably higher quality than that produced by untrained crofters. In 1846, the Countess commissioned the sisters to weave lengths of tweed with the Murray family tartan. 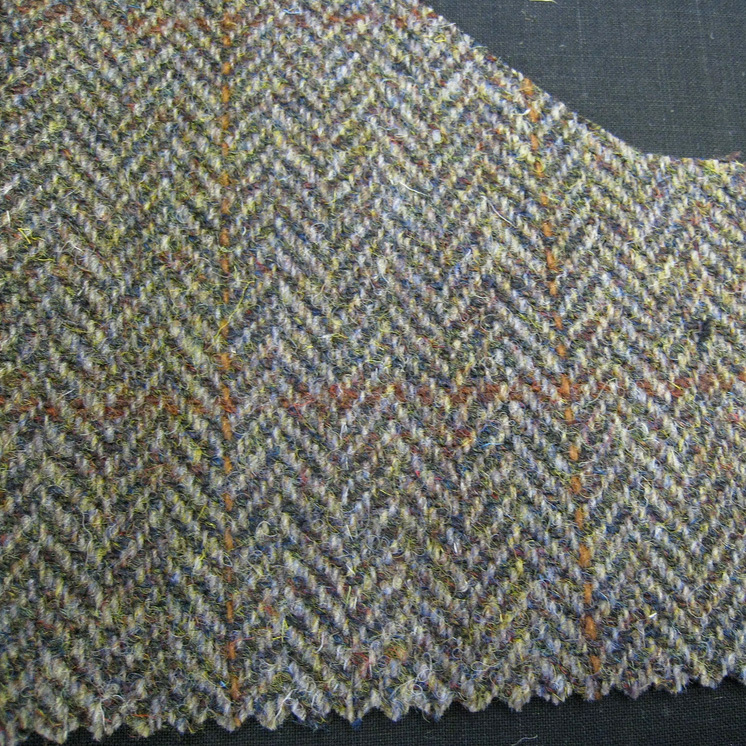 She sent the finished fabric to be made up into jackets for the gamekeepers and ghillies on her estate. Being hardwearing and water resistant, the new clothing was highly suited to life on the Dunmores' estate. Lady Catherine saw that the jackets worn by her staff could be ideal attire for the outdoor lifestyle that was prevalent amongst her peers. The Countess began to promote the local textile as a fashionable cloth for hunting and sporting wear. It soon became the fabric of choice for the landed gentry and aristocracy of the time, including members of Queen Victoria’s inner circle. 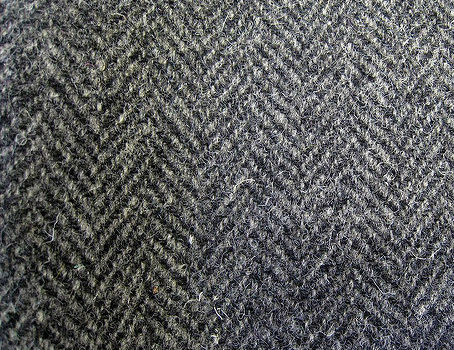 With demand established for this high quality "Harris Tweed", Lady Catherine sent more girls to the Scottish mainland for training. She improved the yarn production process to create a more consistent, workable cloth and by the late 1840s, merchants from Edinburgh to London were supplying the privileged classes with hand-woven Harris Tweed. 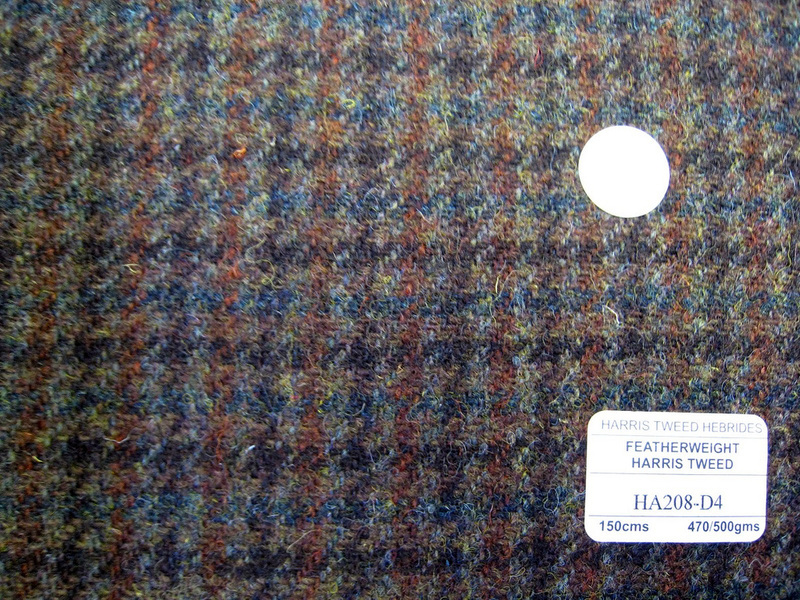 From this point on the Harris Tweed industry grew, reaching a peak production figure of 7.6 million yards in 1966. 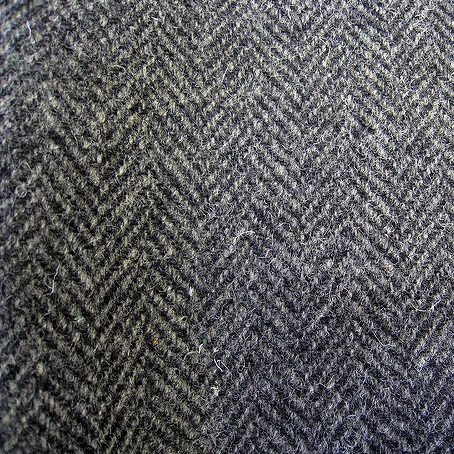 This text is using material from the Wikipedia article Harris Tweed, which is released under the Creative Commons Attribution-ShareAlike 3.0 Unported License.